Nearly 90 4J teachers, administrators, classified staff and volunteers, as well as many educators from the Springfield and Bethel school districts, were honored at the 2017 ACE (A Champion in Education) Awards Ceremony on Tuesday, April 25. 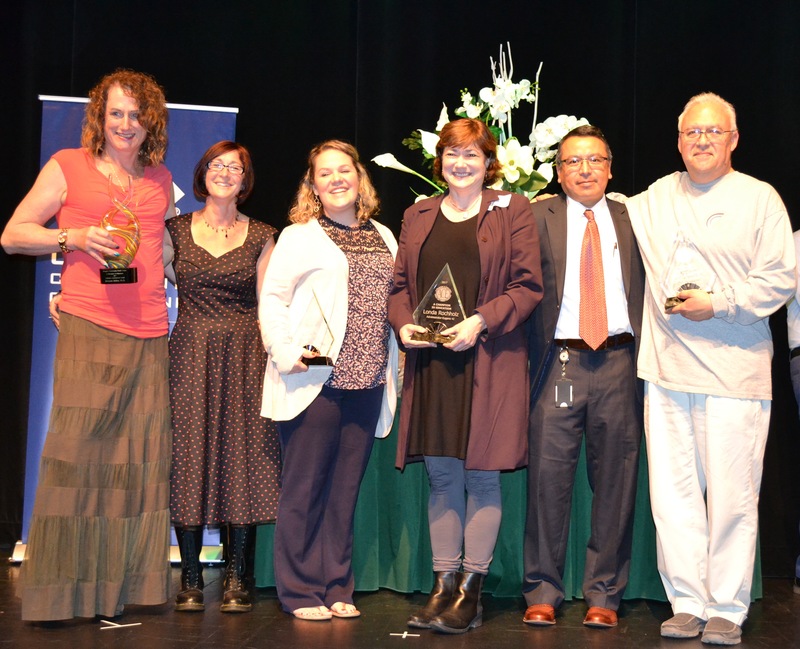 The ACE Awards are sponsored by the local business community to recognize exemplary work by educators in the Eugene 4J, Bethel and Springfield school districts. At the annual awards ceremony, all nominees were honored and four outstanding educators from each district were named as champions. 4J’s 2017 ACE Awards champions are Jaimee Massie, Fernell Lopez, Londa Rochholz and Judy Salisbury. Brianna Stiller was presented with a Lifetime Achievement Award. Each ACE champion’s school will receive a $1,000 award for a project or program at the school. Adding up those awards over the past 12 years, the ACE Awards’ sponsors have contributed $144,000 to local public schools! “Tenacious.” “Collaborator.” “Advocate.” Great characteristics for a champion in education. Add “Funny” and “Upbeat,” and you have a winning combination. Jaimee Massey is a dynamic instructional leader. She nurtures other teachers’ strengths and encourages them to share their skills, expertise and curiosity with each other. She supports other teachers to become leaders and continually advocate for students. Beyond the classroom, Jaimee is a fierce and solution-oriented advocate for teachers and for excellence in teaching, sitting on state advisory teams and organizing Oregon’s first conference for Elevating and Celebrating Effective Teaching and Teachers (the “ECET2” teacher collaboration conference). Jamie is an inspiration. Fernell Lopez is the very model of kindness and compassion. He listens to others, understands their needs, and takes action to support or guide them. He cares deeply about people and helping them be whole in our society without having to give up their culture. He works tirelessly in support of Kelly Middle School’s Latino students and families, and for all students and families. While Fernell is extraordinary in doing what is needed for Spanish-speaking families, his heart extends to the entire school community. Fernell gives his time and talents to build learning opportunities for students while supporting families and facilitating staff. He helps students grow through the GANAS and PILOT Leaders programs. He finds ways to showcase students’ leadership and academic skills while bringing arts into the school and organizing events that bring families together. With his endless dedication, deep understanding, and quiet strength, Fernell is truly a Champion in Education and a gift to the entire community. Londa Rochholz leads McCornack Elementary School with great energy and a warm heart, advocating for children of all ages, supporting teachers in classrooms, creating strong foundations for families, and encouraging students to be their best. She takes the time to personally get to know each and every student, parent, staff member and volunteer. She is committed to celebrating diversity, dignity and inclusion, and teaching students how important it is that all children and families should feel welcome, safe and nurtured. She has an open door policy for everyone—especially the kids. Even on her most stressful day, she is gracious to all. And, when Londa walks down the hall in her bee costume, reminding students to Bee safe, Bee responsible, Bee kind, and Bee respectful, she is Beeing a champion for students and school climate. Her huge heart and true passion for the students really shine through. It has been said that “volunteers do not necessarily have the time; they just have the heart.” Judy Salisbury has not only the time but a BIG heart. Judy dedicates her whole day, 5 days a week, to making Willagillespie Elementary School a better place to learn, grow, and thrive. Her personality and energy are incredibly contagious. Over the past 6 years, her efforts and connection with students and adults have made her a vital part of the learning environment and of Team Willagillespie. When students were encouraged to write volunteer appreciation cards for Judy, they were in disbelief. They said, “She’s not a volunteer! She works here!” Judy’s dedication and commitment are a model of the exceptional school volunteer. She truly makes a difference every day. OCCU ACE LIFETIME ACHIEVEMENT AWARD: Brianna Stiller, Ph.D.
Each year ACE title sponsor Oregon Community Credit Union presents one Lifetime Achievement Award to an individual who has made a noticeable difference in our community through their work. The OCCU ACE Lifetime Achievement Award was created to honor individuals who have dedicated their career to supporting and strengthening education and helping students to grow, thrive and reach their fullest potential. The Third Annual ACE Lifetime Achievement Award was presented to an individual whose career has had a lasting impact on countless students and educators in our community and throughout Oregon: 4J’s own Brianna Stiller. Brianna is retiring this year after serving as a school psychologist in 4J for more than 30 years and coordinating the district’s positive behavior support programs for 11. Brianna’s work has had a tremendous impact on school climate by helping staff and students develop an environment that is welcoming to all students. She has co-authored three intervention programs and her work on positive behavior support programs is recognized both nationally and internationally. She was a key in developing district policy to support transgender and gender nonconforming students in 2015, making 4J a model for Oregon and beyond, and was involved in developing a toolkit to guide and aid other Oregon school districts in supporting gender expansive youth. We are proud that Brianna has chosen to serve her career in 4J. Our students have benefitted from her skilled expertise and her caring heart. Our staff have benefited from her leadership and mentorship. She is an irreplaceable gift to our school district and to our community. The ACE Awards program and awards ceremony are made possible by the Eugene and Springfield Chambers of Commerce and the generosity of sponsors from our local business community: presenting sponsor Oregon Community Credit Union, as well as supporting sponsors Coca-Cola Refreshments, NeuroSpine Institute, PacificSource Health Plans, Hershner Hunter Attorneys, Eugene-Springfield McDonald’s Restaurants, Carte Blanche Caterers, Lane Community College, and All Academic. Thanks are due to these sponsors and to all those who took time to nominate a deserving staff member or volunteer.